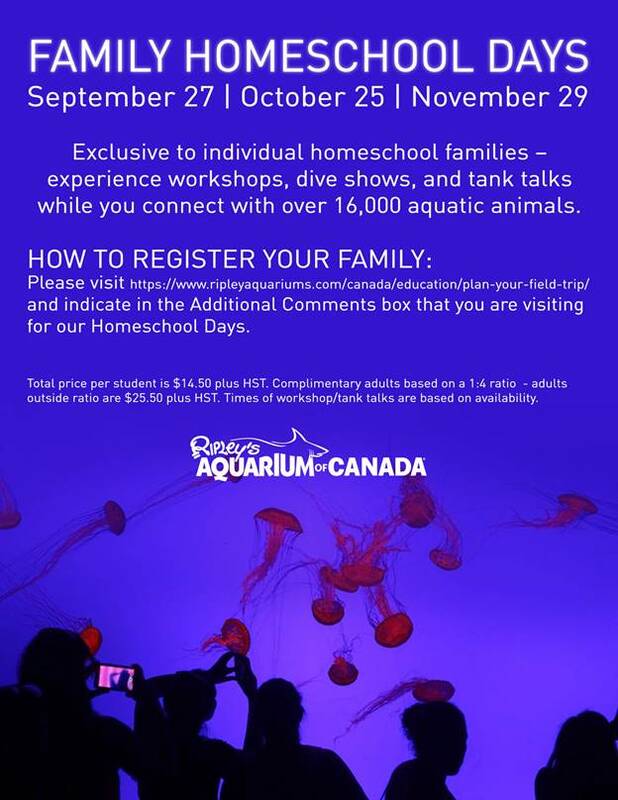 Ripley’s Aquarium of Canada is pleased to announce three Family Homeschool Days on September 27th, October 25th and November 29th. This is an exclusive offer to individual homeschool families to experience workshops, dive shows and tank talks all while connecting with over 16,000 aquatic animals. Each “family” will individually register. Any homeschool family interested in registering is asked to go to our website, www.ripleysaquariums.com/canada/education/plan-your-field-trip/ and fill out the on line booking form. When completing the form, we ask that you enter the word “Homeschool” in the space for “Schoolboard”. No additional coupons, passes or annual pass discounts apply. The minimum age for children to participate in a workshop is 4 years old, and children 2 and under are free when accompanied by a paying adult. Primary workshops are recommended for students ages 5-7, junior workshops for ages 8 – 11.